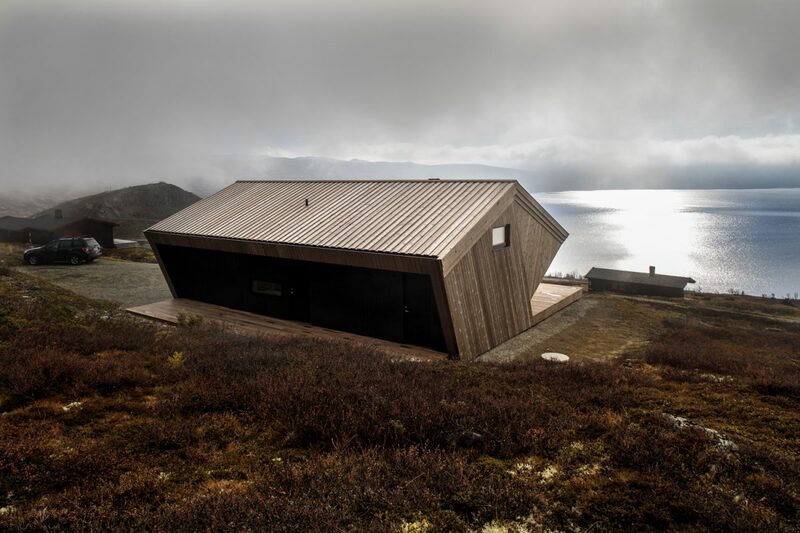 A weathered mountain top with a magnificent view and strict building regulation determined Arkitektværelset’s design of this secluded cabin. The high altitude mountain area of Imingfjell, Norway, is beautiful, but weathered and windblown. 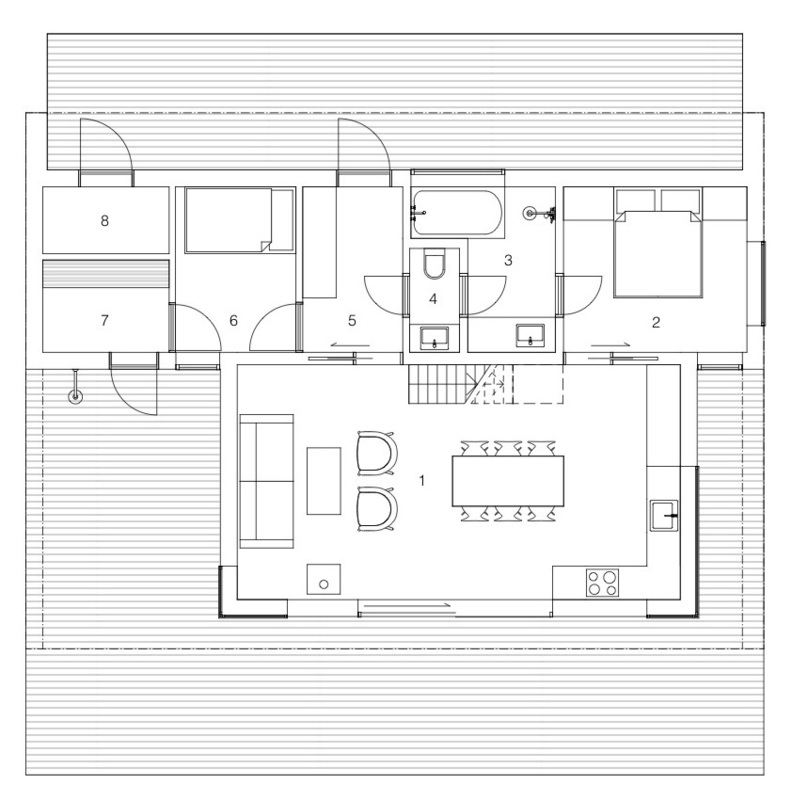 It also has rather strict building regulations. 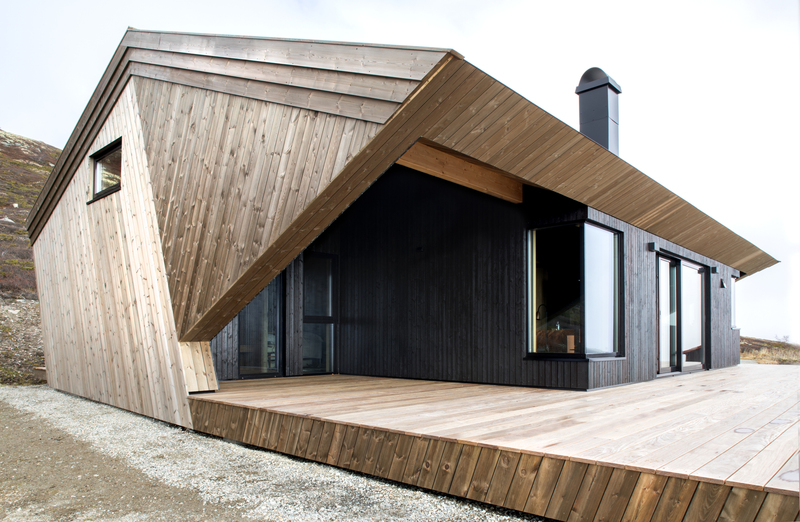 Cabins are to have sectioned windows, standing wood paneling, 22-27 degrees gabled roofs, and triple bargeboards. 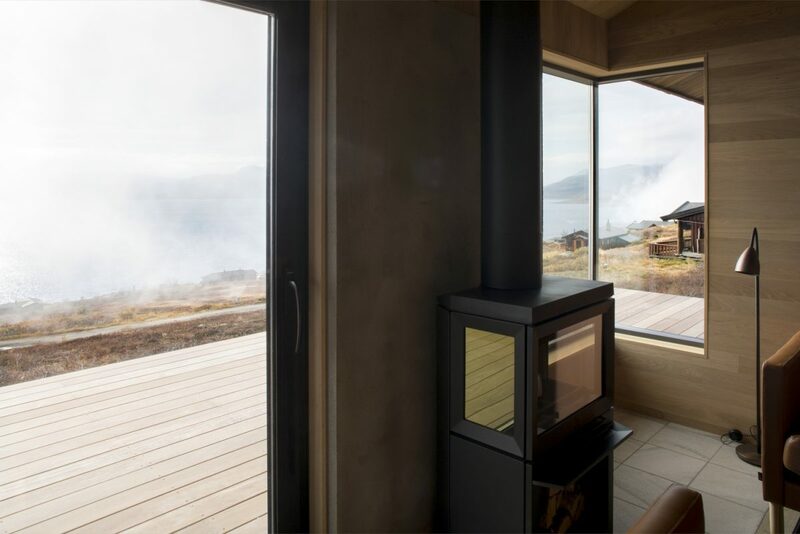 «Limitations are the mother of all playful creativity, and in this case, it really became a goal to try to create within the boundaries,» says head architect Grethe Løland of Norwegian studio Arkitektværelset. 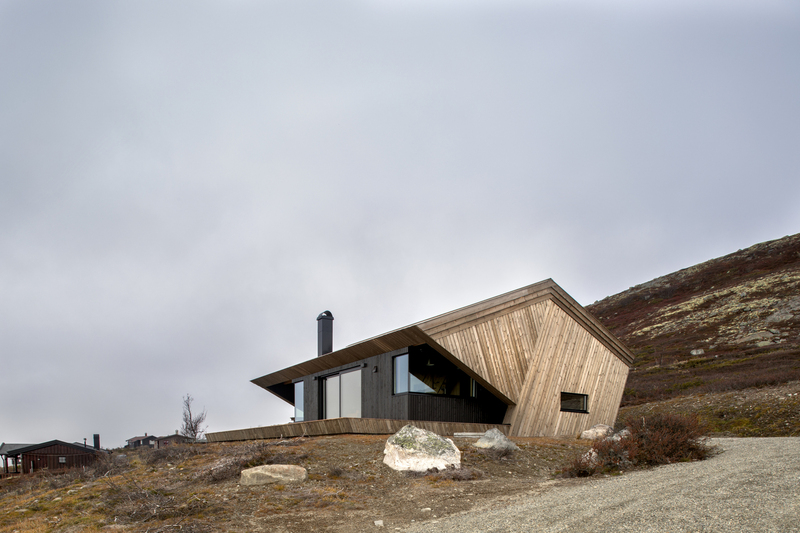 The plot for the cabin is situated at an altitude of 1125m, within an area exposed to avalanche danger. A more detailed analysis, however, showed that it was securely outside the danger zone. 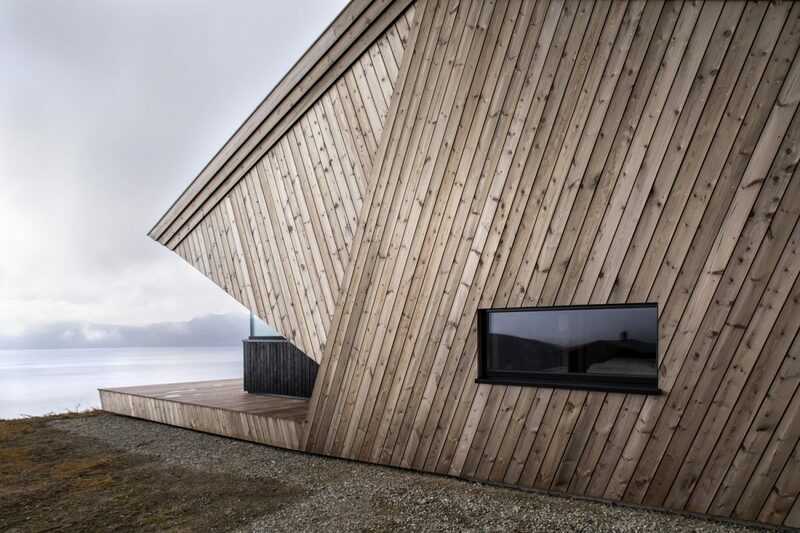 «We kept the original idea of a «protecting hood», from the initial project sketches, says Løland. 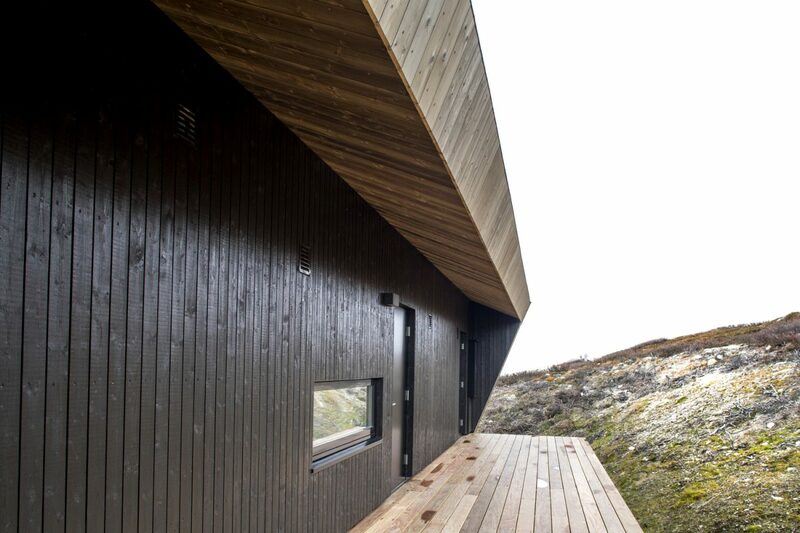 The ore pine roof protects the «eyes» of the cabin in the front, and prevents rain to dribble down the main entrance in the cabin’s «neck». 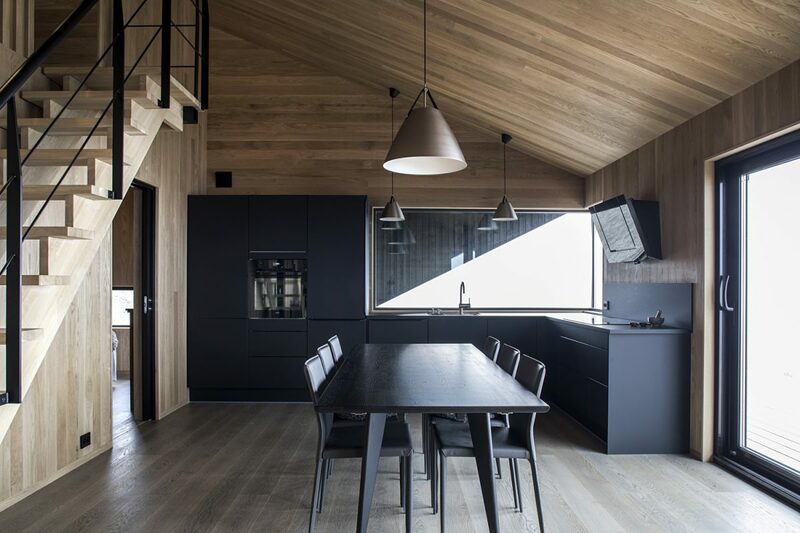 The hoodie thus has obvious practical functions, but at the same time, the contrast between the angled pine paneling and the black painted cabin body creates a strong geometric form. 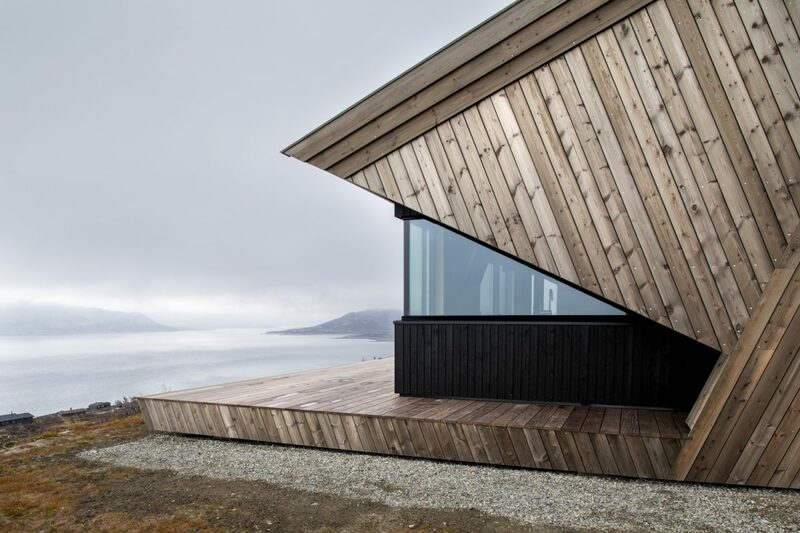 «The building becomes an understated iconic sculpture in an area that most cabins look alike, and our clients really liked its form,» says Løland. 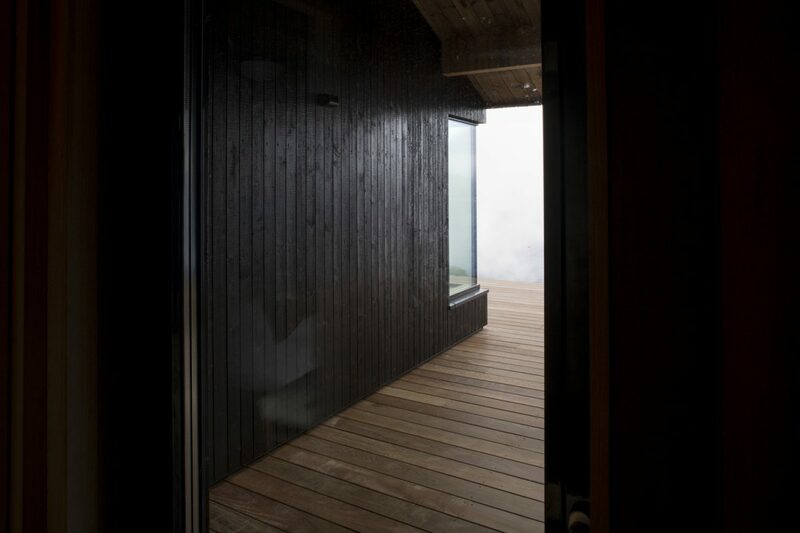 Their clients had commissioned a robust and efficient little cabin oriented towards the view over the lake. 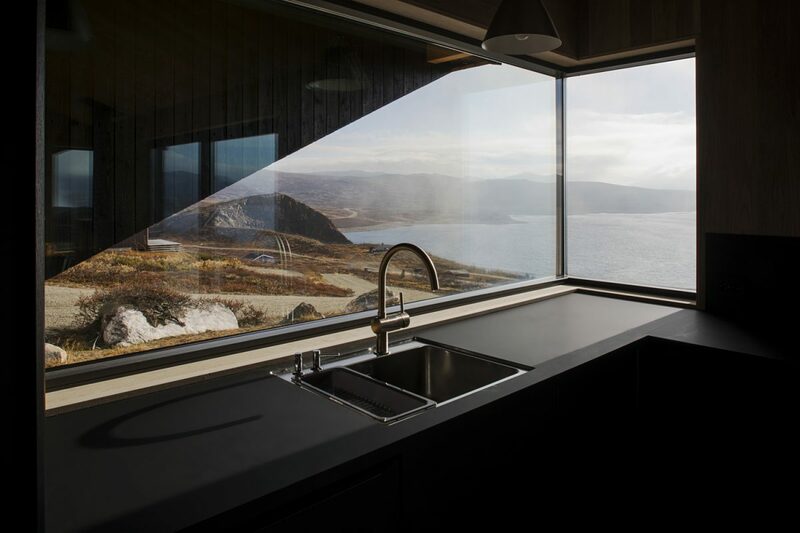 The panoramic, divided corner windows and large sliding doors in the front, bring the nature close into the kitchen and living room. 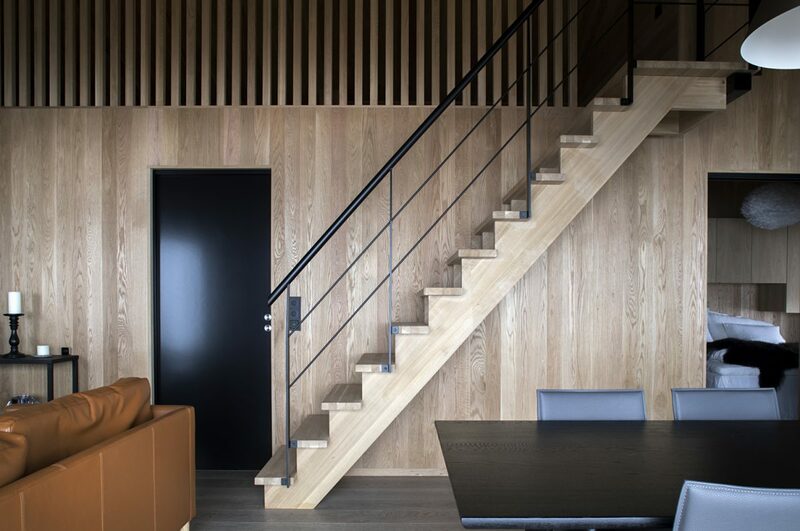 Inside, oak flooring and paneling also reflects the natural colors from the surroundings. 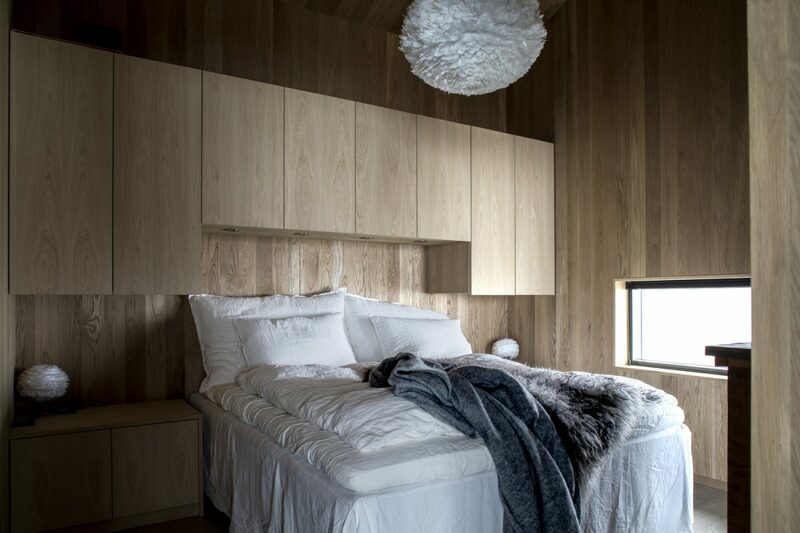 In the back of the cabin, there is a master bedroom, bathroom and a sauna that ingeniously doubles as a guest room. Above the rooms there is an open attic that offers sleeping space for 8 people.